Does a Kitten's Attitude Change After Being Neutered? You may not detect any behavioral changes in your neutered kitten. If you're worried that neutering your wee kitten will change his entire temperament for the worse, don't be. Getting your youngster fixed should only give him a more laid-back, relaxed and calm disposition, thankfully. However, in cases of especially young kittens, you may not notice any differences at all. Male kittens generally become fully physically mature around 6 months old, although it always differs depending on the individual animal. In fact, some kittens reach maturity as young as 4 months of age. If you get your little one fixed before maturity, then you probably won't notice any changes in attitude at all. However, if you wait a little bit longer, you might just bring home a new and improved feline. 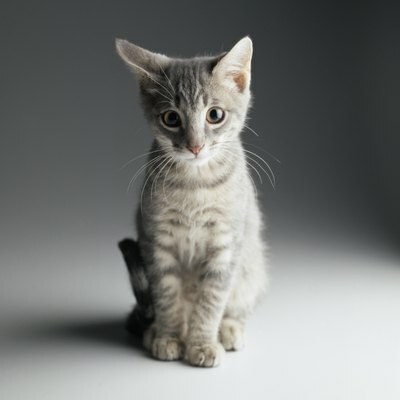 When it comes to a specific age for neutering a wee kitten, the College of Veterinary Medicine at Cornell University suggests a safe and suitable time bracket as anywhere between 3 and 6 months old. If you neuter your pet toward the latter portion of that time frame, it is very possible that he will have begun to exhibit hormonal behavioral patterns. In those cases, a significant behavioral improvement may be on the table. Neutering a kitten involves removing the testicles, and as a result greatly reducing his testosterone levels. Once this occurs, a mature male cat no longer is compelled to mate, thus cutting out a lot of frustrating mating behaviors, including loud nighttime meowing and yowling, stressful urine spraying, aggressive physical fighting and running away on searches for the opposite gender! If your fluff ball is old enough to have already started showing signs of this type of behavior, neutering him will gradually but surely eliminate it, fortunately. You will be able to meet a more focused kitty that isn't an antsy and hormonal escape artist -- not a bad deal at all. On the other hand, a very young kitten that hasn't yet begun to experience hormonal urges basically will remain the same. Apart from hormonally-driven actions, a kitten or cat's overall temperament never should change after surgery. If you're unsure as to whether your pet still is classified as being a "kitten," the ASPCA indicates that felines become fully mature when they are approximately one year old. On your cat's first birthday, you can celebrate his adulthood, although he'll probably always seem your little baby. Can a Change in a Dog's Diet Make the Dog Shed More? Why Does a Cat's Meow Change? Should You Change a Cat's Name When You Adopt? What Color Are a Kitten's Eyes Usually?